Suffering with problem skin? An unlikely, but very good place to look for answers is your gut. 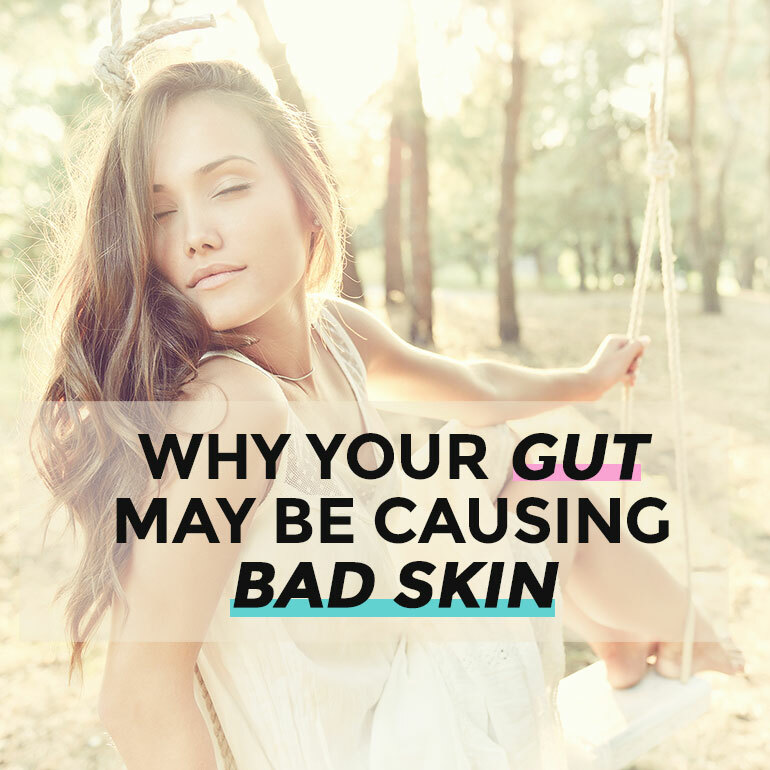 More and more research is connecting gut issues with problem skin. For healthy, clear skin, ditch the chemical-laden topical creams. They’re a band-aid at best. Instead, put the spotlight on healing your gut – your skin (and wallet) will thank you. How can altered gut function affect the skin? The bacteria in our intestines are akin to an organ. When healthy and in balance, our gut bacteria perform a slew of functions, including breaking down food, aiding our immune system, producing vitamins (biotin and vitamin K), preventing the growth of harmful bacteria, allergies, and disease, and a whole lot more. But when things go wrong and the bacteria in our gut are out of whack, there are consequences. Important is the balance of bacteria; if they grow too high or low in number, or there are too many of these and not enough of those, our gut flora become harmful and turn on us – implicated in everything from cancer to weight gain. These little guys can also affect our skin and seriously compromise our self-confidence in the process. Bad bacteria = bad skin? Our skin’s health depends greatly on that of our gut. Over a century ago, dermatologists Drs Stokes and Pillsbury linked changes in the microbial flora to inflammation that can manifest in the skin 1. They connected bad skin with abnormal levels of stomach acid. Stomach acid acts as a disinfectant killing bugs in the food we eat and helping to prevent infections. They explained that 40% of those with acne had low stomach acid (hypochlorhydria), a condition which induces migration of bacteria from the colon — where they should remain — to the small intestine where they do not belong. Cause nutritional deficiencies due to maldigestion and malabsorption of proteins, fats, and carbs, as well as vitamins. SIBO can lead to deficiencies in vitamin B12, as well as vitamins A, D, E, and K (fat-soluble vitamins) essential for optimal skin health and overall good health 3,4. Increase intestinal permeability (or ‘leaky gut’) causing both systemic and local inflammation, which is linked with skin problems. Many acne patients for example, suffer from increased intestinal permeability 5. Stimulate the production of substance P, which is known to promote inflammation 7. The skin’s principal function is to protect the body against physical (or mechanical) impacts, changes in temperature, microorganisms, radiation and chemicals. But research also suggests that both psychological stress and gut inflammation can compromise the integrity and shielding properties of the skin 7. What this means is that when the body is stressed and inflamed, the skin’s ability to fight bacteria is compromised — this usually further aggravates any skin infection or inflammation already present. SIBO is 10 times more prevalent in those with acne rosacea compared to healthy controls 8. Adolescents with acne are more likely to suffer from constipation, bad breath and gastric reflux. The same study found that abdominal bloating was 37% more likely to be related to acne and other seborrheic diseases 9. A Russian study found that 54% of acne sufferers have significant alterations to their gut flora 10. Acne sufferers appear to have more bacterial strains in their stools 11. If you’re suffering with IBS-type symptoms such as bloating, tummy distention, cramping, abdominal discomfort, ask your doctor to check for SIBO. A direct culture is considered as the gold standard although the lactulose breath test is more widely used to test for SIBO. If your gut has been severely affected by SIBO and you’re suffering from extensive bacterial overgrowth, you may need antibiotic therapy (check with your doctor first). Antibiotics regularly prescribed include rifaximin, metronidazole or ciprofloxacin, neomycin, and tetracycline. Do you regularly suffer from heartburn and GERD? If yes, this could indicate low stomach acid as well as bacterial overgrowth in your stomach and intestines. You may also want to ask your doctor to test your stomach acid with a device called a Heidelberg capsule. Reduce your intake of refined carbs. Steer clear of artificial fructose and artificial sweeteners. Gradually increase your consumption of fresh lemon juice, apple cider vinegar and fermented foods. Oral probiotics have been shown to improve skin conditions such as acne by reducing inflammation, oxidative stress and by improving the efficiency of the intestinal barrier 12. In one study, 80% of participants who received a probiotic experienced improvement in their acne 12. You could try to take Lactobacillus acidophilus and Bifidobacterium bifidum – clinical studies have demonstrated their efficiency in improving skin conditions 13. Since an omega-3 deficient diet may increase your risks of SIBO 14, you may want to consume wild fish at least twice a week or take a high quality omega-3 supplement. If you suffer from acne, you could also try to eliminate pasteurized dairy products from your diet for at least a month and then gradually reintroduce one product at a time to determine whether dairy causes issues for you. Studies suggest that pasteurized unfermented dairy increases levels of insulin-like growth-factor (IGF-1), a substance that favors acne formation 15. You may also want to keep a symptom diary to note any progress as you put each step into practice. This will help you identify what works for you specifically.